For this 55th anniversary honoring the tragic early demise and legacy of John Kennedy, the 35th President of the United States we decided to dedicate our time recently to a thorough evaluation of the JFK assassination related film archive. A current understanding of the serious allegations of tampering involved in the Abraham Zapruder film was our foundation, and surprisingly some of our conclusive finds were quite striking and pervasive in their ramifications. Here below, is a sampling of some of the bizarre film anomalies we discovered. 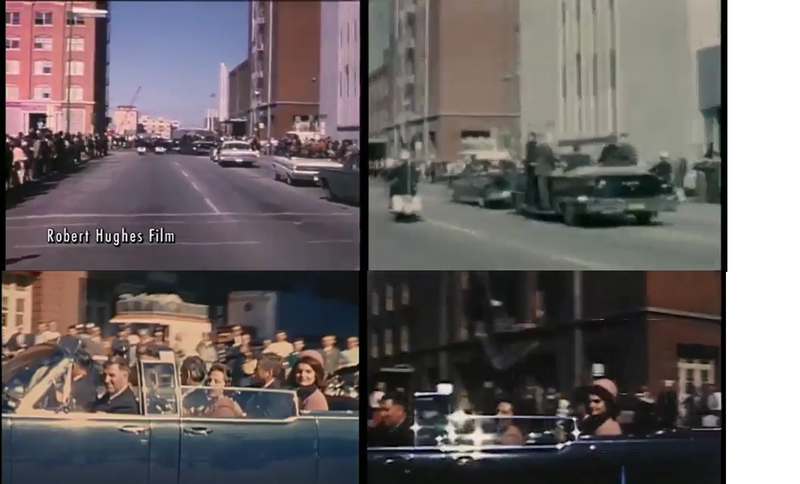 Because of a previous vast exposure of the Zapruder films questionings’ and with the lack of comparison footage similar to that of Zapruder’s angle, we decided to concentrate on the films depicting Houston Street before the turn onto Elm. 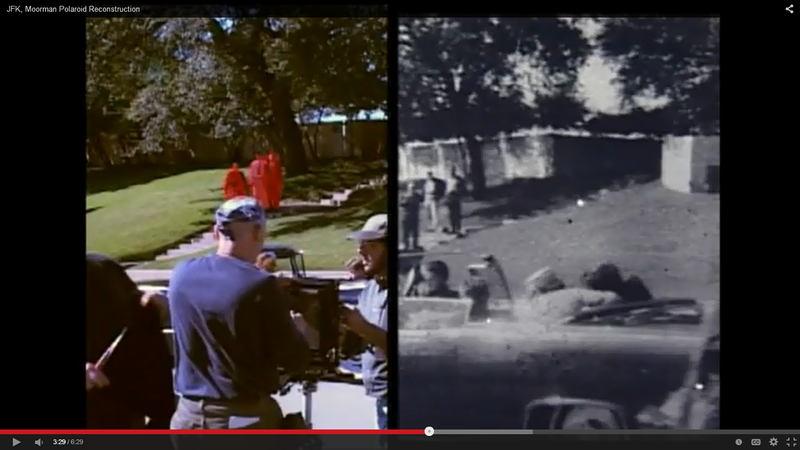 Beneficially there are more examples of convergence and overlapping within this area of the Dealey Plaza film record. This area of Houston Street before the westward turn onto Elm is also where we found the majority of our film anomalies, a sampling of them are displayed below. 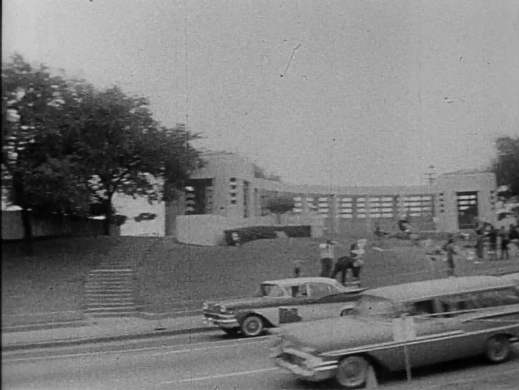 An early instigator for the need of a fuller study this anniversary was a mysterious black and white video still, or photograph of the Texas School Book Depository which came to our attention over a few JFK assassination related television specials from years past. Not too surprisingly it was Robert Erickson who produced both Discovery Channel specials and the archival footage we used in our study was allegedly from official sources, including some of the copyrighted assassination films that the Sixth Floor Museum (SFM) at Dealey Plaza archives. Compare the Hertz signs on top of TSBD. A similar anomaly found in the above black and white faked image was also seen in the Robert Hughes film. From there we started to compare Hughes to the Towner family film record, a still photo by Jim Towner and video camera footage from his daughter, Tina Towner Pender. This mentioned anomaly and the black and white obviously false image of the TSBD were our catalysts that led us to find more, such as the windows on the Dal-Tex building discrepancy. The Dal-Tex building was the red building seen to the right of the TSBD in the color image below. 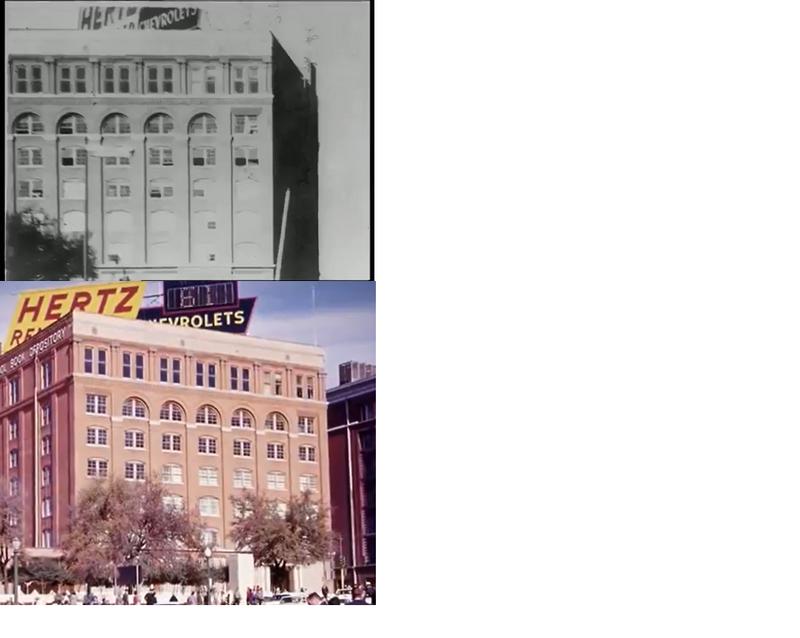 Shown on the upper row of images below is the TSBD, depicting the true nature of the Hertz sign, which was placed diagonally across the roof and very large in size which is why the sign is now stored broken down in pieces at the SFM @ Dealey Plaza. Windows of the Dal-Tex & Hertz sign anomalies. In the color image from above we see there was and still today some double rows of windows on the Dal-Tex secondary building, in fact seven windows in a row on its second and third stories. 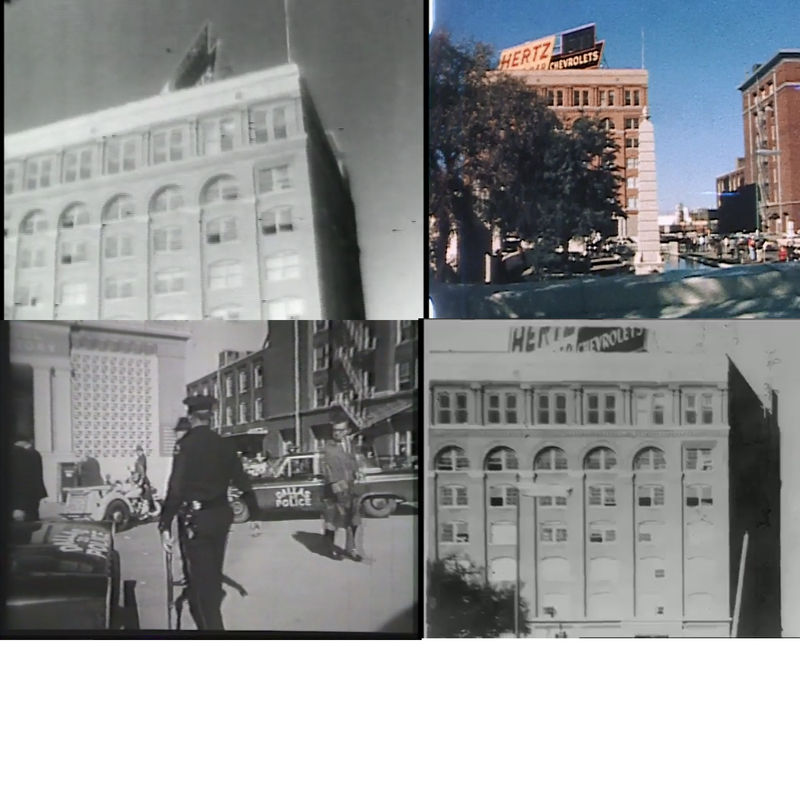 The windows are visually corroborated in the bottom left still, which is of news reel footage taken sometime shortly after the Dallas Police’s attention was drawn to the TSBD the afternoon of the assassination. On the lower right again we have the proven altered TSBD news reel footage still, notice that the windows are open or closed mostly in accordance to that of other known photos from that day. Revealing one aspect that the forger did get correct, yet when comparing the Hertz sign with the other authentic images seen above reveals that the job done on the fake sign was surely of its own league. On the upper left in the image below is the Robert Hughes film, note there are no double rows of the seven windows visible on the Dal-Tex secondary structure. The image to the right has them; it is from an early frame of the Muchmore film. How can windows appear in one film and not the other, especially since both were taken from very similar positions? On the bottom row are Jim Towner’s still photograph on the left and his daughters moving film on the right. Yet the question of the color of paint of a small stripe is only one anomaly concerning the van. In both Towners family footage the van is parked in a slightly different location than that of Hughes and Muchmore, and yet all four films and photos were taken within seconds of each other. Note that in Mr. Towner’s we see the white van (with orange stripe) and it is visibly apparent that this van is not parked in front of the ground level window opening like it appears in both upper frames. Strikingly without the orange stripe visible. And in Tina Towner’s film still it reveals the windows not seen in Hughes, but are in Muchmore’s and the angling façade of the Dal-Tex building has now come into frame and that means that the white van in the Towner family film record was further back than it is seen in both Hughes and Muchmore films. All of this imagery was taken within a span of a dozen seconds. How then can this van have been moving? All of these images cannot be from authentic films and it is still possible that none of them are unadulterated and genuine films from Dealey Plaza. If this movement of the van was genuine, might have this van have run somebody over when it briskly changed locations as the multiple films depict. Furthermore, shortly after the shots were fired the van is completely gone. Did anyone see this van drive away suspiciously right after shots allegedly were fired? Or instead possibly was it never there in the first place, only being a composite piece in completely faked or heavily altered imagery? Obviously these sample images reveal that all cannot be genuine video or photographic examples, and being from a case that was supposedly solved within days, leading to a lone assassin why would film artifacts need to be altered or fabricated? Lee Oswald surely cannot be the culprit in the film tampering’s’. This made us wonder when exactly did Secret Service agent Clint Hill fall back from the presidential limo to that of the SS follow up car, as Hill has said in interview before that he did this when the motorcade entered into Dealey Plaza. Yet just as assassination eyewitness Mary Moorman claimed she stepped off of the grass and onto Elm Street the official film records depict neither of these witness testimonies. 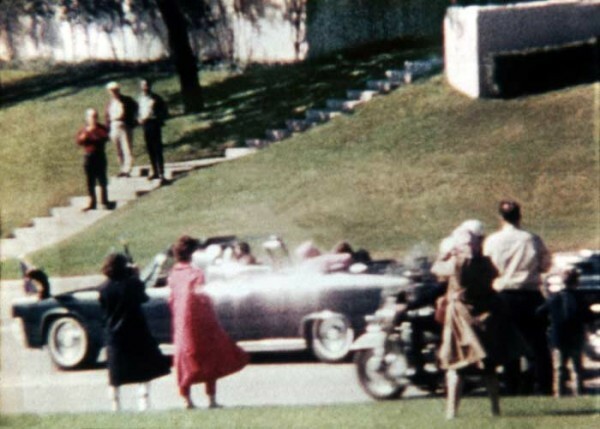 Even though these images were taken from different and sometimes similar angles we should still be able to correlate fixed landmarks in the background, but many times that cannot be accomplished with the JFK assassination related imagery. Films and pictures which are supposed to be authentic, but what besides dichotomous anomalies would one come to expect in this strange case of the Kennedy assassination? What Sort of Force Guided him in This Most Inaccurate Research? Previously when I wrote an article about open factual disinformation in the television medium when covering the JFK assassination, titled ‘Gary Mack and his “Magical” Powers of Dissuasion’, http://www.ctka.net/2014/mack_commentary.html”>http://www.ctka.net/2014/mack_commentary.html, I I knew then while comprising it that there was more to it than just Gary Mack, who is there shown to be deceptive and calumniating in his portrayal of evidence and orientation, and also in his and Unsolved History’s (UH) own scientific experiment. At that time while I could sense a higher force at UH guiding Gary along, as when he knowingly falsifies the historical record by claiming the three presidential motorcade spectators standing in the middle of a grassy knoll staircase, “so they were in the way” of such a frontal bullet path just having been previously established as valid in their experiment, but then unknown forces working with the post production crew created this now infamous collage. 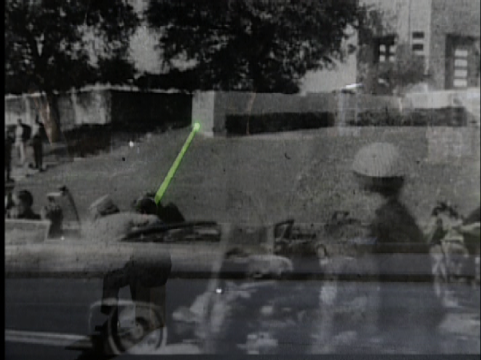 Which consists of a small portion or segment of the said three spectators from the most famous of Mary Moorman’s photographs taken Nov 22, 1963, overlain on top of UH’s night- time background shot of the grassy knoll filmed in the fall of 2003. Quite obviously one can interpret that this was no honest photographical overlay as I successfully argued in my previous article on Gary, peer reviewed and found at http://www.ctka.net. Instead clearly it was a chance for other(s) then unknown to me, with Gary as their front man, to paste over a proven from their own hands feasible angle or source of a bullet trajectory, with that of the physical photographic images of the three staircase spectators from Moorman’s photo. So their goal simply was for the viewer to recognize via their fraudulent collage that there exists a historical precedence of physical obstructions to such a frontal trajectory or path. (The UH overlay) Watch this clip at our Youtube page That being the angle from the north storm drain area, and in UH’s 2003 laser trajectory tests looking for potential sources of shots from the front, their laser delineated a clean path to the JFK stand in’s head from atop a storm drain located on the north side grass of Dealey Plaza. Although Gary Mack and UH still proclaimed that there stood these three men in the middle of the steps on the afternoon of Friday November 22, 1963, who then obstructed such a shot from this north storm drain area. Yet their major problem is that these three staircase spectators are well documented in multiple films and videos to be standing in a much different positioning than where the post production personnel for UH places them. The fact that the three men are standing on steps in this inaccurate overlay (shown above) is unchanged, only their positions and the placement of the staircase in correlation to Moorman’s and other known photos has been altered. In fact their overlay is altered in such a way to bring these three staircase spectators into the line of fire from the area of the knoll where it meets the overpass bridge, and along with the men the entire staircase has even been moved easterly, bringing them closer to where the limousine was when Kennedy was fatally struck. Along with this, seven steps on the staircase have been eliminated below where the three stood, assumingly to more easily portray these men at the bottom of the sidewalk to then become physical proof for Mack and the narrators’ supposed obstructions or blockade of such a shot from the western end of the grassy knoll. 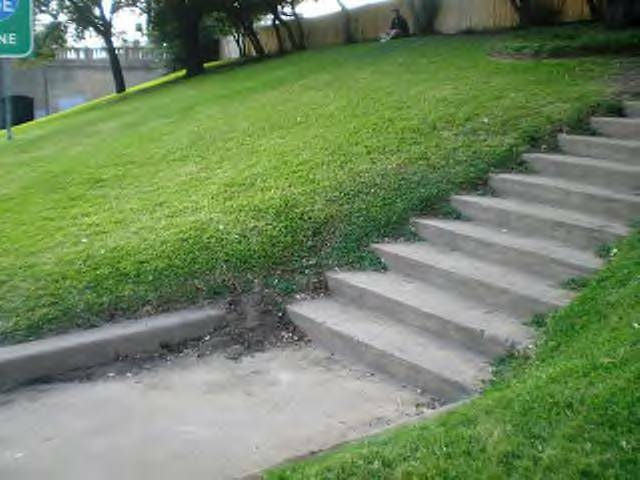 Also in creating this false imagery some quite prominent landmarks and architecture had to be compromised, like the aforementioned seven steps that were eliminated, and the fact that this grassy knoll staircase had then and does still today, a sort of T shaped, walk up between the first step and the sidewalk. This still present landmark was eliminated in their altered overlay of images, yet still though we know Mack must have been knowledgeable of this short walk up buffering the staircase and the sidewalk. We can even see in this image taken from “The Conspiracy Myths” episode that Gary Mack was surely cognizant of this, as Gary can be seen standing in this walk up along with historian Daniel Martinez and others present for the production. We can thus interpret in the altered overlay that the three men are standing on steps is unchanged, only their positions and the placement of the staircase in correlation to Mary Moorman’s and other known photographs have been changed. Here above is a clear up close picture of the walk up where it connects to the staircase and is looking back towards the end of the knoll, where the storm drain is located behind the picket fence, right where it meets the overpass bridge seen on the left. At the top right of the image is where the break in the staircase steps is and below it are some of the seven steps that were removed in the fraudulent overlay. Clearly one can see that there is good line of sight that if the perspective was broadened enough, it could be interpreted that at least hypothetically there could have been an angle for the head shot which most likely was the fatal wound. If these three men on the steps were in the location which we know they were, and not where Gary inaccurately places them, then there remains a sizeable enough opening to allow a bullet path or trajectory to Kennedy in the street from the north storm drain proximity. Even an associate of Gary’s, researcher Dave Perry shared with me his knowledge that Gary and the show were incorrect in the three men’s placement. 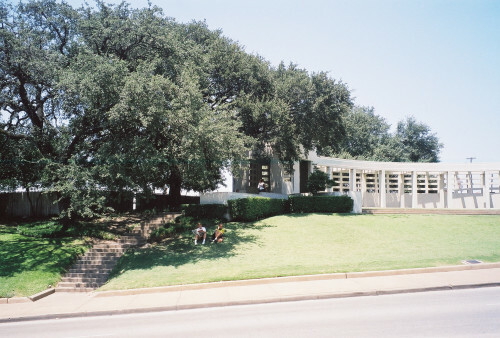 He was without even watching the segment able to confirm this by using an architectural plan of Dealey Plaza created for Greg Ciccone, and so Perry stated “using the Ciccone drawing a shot for this location fired to the point of the fatal head shot would not have an effect on the three individuals standing on the steps. The bullet would pass several feet to the south of their position with Emmet Hudson being the closest to the path of the bullet. So if Mr. Mack claims the men would be in the way that would be incorrect”. (His emphasis) Even though Perry was a part of this production, he was quite adamant that he was only present for a separately filmed segment which he participated along with Gary, and as hard as it is to believe Perry informed me that he no longer could locate his personal copy of this production, and that is why Perry stated that “if Mr. Mack claims the men would be in the way”, thereby negating to agree with the obvious fact that the trio were not only verbally said to be in the way, but were also blended digitally during post-production into an absolutely fraudulent graphic image to substantiate this blatantly false allegation. The size of this overlaid segment of the men and the staircase from Moorman’s photo has also been altered, so much that an accompanying segment of the fence behind the men has doubled in size compared to the real fence seen in the modern portion of the before and after image. It is just that when filming at night to get the laser to show up, also aided in a more seamless image, as it is quite hard without adjusting the contrast to see where the actual height of the fence line is. (These two images above are the before and after images as Gary points out and explains how albeit falsely that the 3 spectators were in the line of sight. Seen above on image at left, the left arrow denotes the true fence height and the right arrow shows the concrete wall that is missing in the altered after image, seen at right. In this image the true fence height can still be seen next to the added altered fence line portrayed as much higher, and the red circle below the arrow denotes the break in the staircase, where approximately the three men stood.) This may have even been planned to work out as so. 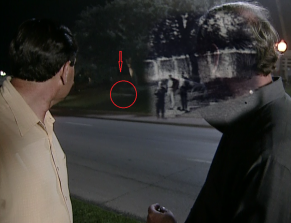 We can also see that when this segment of the men, the steps and part of the picket fence has been increased in size so much that the short concrete wall and the bushes atop the knoll vanishes under the altered overlay, along with most of the concrete pergola with a small fraction still visible to the right of Gary’s head. The part of the pergola that remains, which has this Moorman photograph segment overlaid onto, so falsely portrays the fence as so high that it is nearly to the height of this quite tall concrete pergola. Very tall at least in comparison to the actual height of the picket fence which in some parts is easily over 15 feet in height. We can clearly interpret that with all these historical inaccuracies in the supposedly true overlay which the UH narrator even alluded to as proof by saying that, “witnesses and obstacles in the terrain conclusively eliminate these storm drain theories”, but we know that this basis is false, so with all this incorrect information how could it be logically possible for someone like Gary Mack to have ever seen the finished digitally created overlay and not object to its inaccurate depiction. As Gary is the Sixth Floor Museum’s head curator and archivist, and has spent years studying the known facts in this case, his place of employment, the museum is just yards away from the knoll and the staircase, and Gary even spent years going over blowups of the Moorman photo, which is from where the segment of the three men in the overlay is taken from. So unless Gary never watched the finished production or saw the overlay, there logically seems no wriggling room to debate his innocence of knowledge to carry out this ridiculous claim of the three men being in the line of sight or fire from the western end of the grassy knoll. Even after the fraudulent image is shown and the narrator stated that this and other things conclusively eliminate these storm drain theories, Gary Mack adds on by saying, “but yet the theories persist, and I don’t know what one can do about it.” Well Gary, with all these incorrect statements made by someone so knowledgeable of the terrain and facts of the assassination, it sure looks quite bad for you, that you logically must have known what was going on and did try to do something about it, or else one could wonder how in the hell did you become and stay head curator and archivist for the Sixth Floor museum. One other assumption could be that even though Gary verbally stated that these men obstructed such a shot, that he was not truly cognizant of his statement and was somehow compelled to do so by some other force(s). Yet with all the inaccurate statements he has made to at the least verbally deny this storm drain theory it is quite hard to believe he wasn’t cognizant of these inaccuracies and their agenda to manipulate the facts. 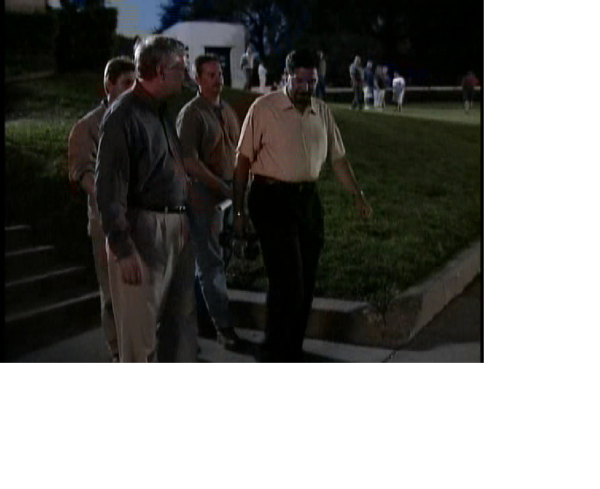 So then in the later 2003 episode, when Gary falsely stated that, “we know from the pictures, that there were three men standing on the middle of the steps there, so they were in the way”, he still seemed to have help from others because this altered image overlay was prepared, assumingly in the post –production, and seemingly created to match Gary’s false claim that no line of sight for firing at the President from the front, or near the north storm drain could have been possible without injuring the bystanders. They even have stooped to the level of altering imagery and the pending results of their own supposed scientific experiment all to manipulate the historical record, and logically one could easily deduce that this was done to keep this falsity alive, which is the portrayal of a lone shooter being behind the assassination and that being Lee Oswald. Now then quite evidentially it seems that at least one accomplice working with or likely directing Gary in their agenda would be a superior to him, in producer and director Robert Erickson. Therefore with Erickson being both a producer and the director perpetually for UH’s JFK productions, he then would in fact have a superior role in multiple aspects to that of Gary’s in their creation of this episode. Who else would be involved at this point is not clear. 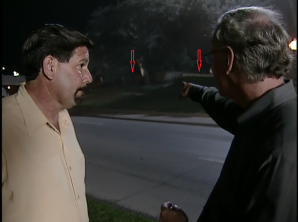 Although with Erickson being both Producer and Director of both the later 2003 Unsolved History episode, “The Conspiracy Myths”, and the earlier 2003 episode, “Death in Dealey Plaza”, and also some other episodes on the JFK assassination for UH, we can deduce that he surely must have had some input if not to where Gary pointed to where the men’s place was claimed, and falsely stated that “so they were in the way”. Then at the least, Erickson must have been knowledgeable of the post-production aspect when the three men were fraudulently placed in the line of a just proven potential fire, that being the moment that the segment of the Moorman photo with the three men and staircase was digitally layered inaccurately over their night time shot of the grassy knoll background. So when looking back at the earlier 2003 UH production, “Death in Dealey Plaza”, and acknowledging that it was Erickson who produced and directed, and so then logically should have been present alongside Gary during the filming of the Moorman photo restaging. So how did he manage to oversee the false placement of the three men in the overlay on “The Conspiracy Myths”, and allow Gary to inaccurately describe the three men’s positioning as being in the way from this acknowledged potential frontal shot location? How can he not be just a culpable as Gary, or possibly even worse, maybe even prodding him? In every single UH JFK related episode there has been Robert Erickson, performing the roles of producer and director. 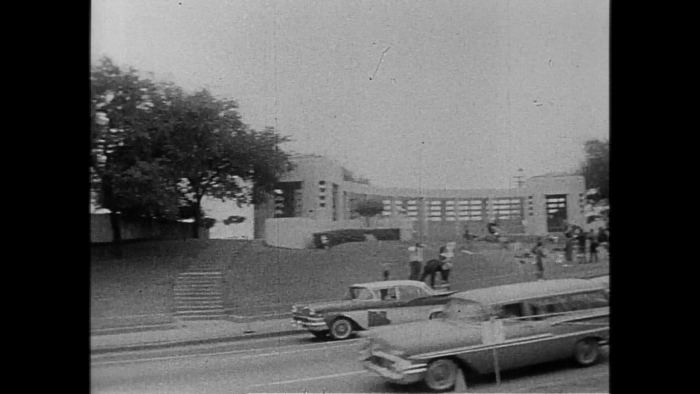 In the episode titled “Death in Dealey Plaza”, Erickson produced and directed Gary and others in one certain segment where the crew attempted to restage the famous Moorman photograph and reproduce the moment. Here we can see an actual image from this episode, where in the post production aspects, a split screen shot was created with their restaging on the left hand side, and the actual black and white Moorman photo at right. So it is not hard to realize that in this earlier created episode, Erickson, as producer and director, and Gary as the Sixth Floor Museum’s resident expert, are signing off as knowing quite well that this is the actual placement of these three men. As they made as well as they could, an exact reproduction of the famous Moorman image, we can even read a quote from Gary, at a Discovery Channel discussion page by W. Tracy Parnell, that Gary even said of himself that, “I was fully involved in the restaging”. Quite obviously now when looking back that when Michael Yardley’s night time laser shot experiment validated a line of fire from the north drain area, that Erickson and Mack took it upon themselves to make sure there was a way to show a historical precedence of obstructions for such a shot or angle. I was once able to contact Yardley and explained to him how this experiment he participated in as a weapons expert was compromised, sadly he only expressed that this was intriguing, but that he hadn’t the time to look into it now. I guess we are to believe that he is so busy out on the clay pigeon range and with oiling his guns all day that he could not take the time to see if the results of his own rifle experiment were useless. Well even so, in the least it illuminates a distinct possibility that persons connected to these UH JFK episodes are aware of likely fire or shots from the front and possibly emanating from somewhere on the grassy knoll. 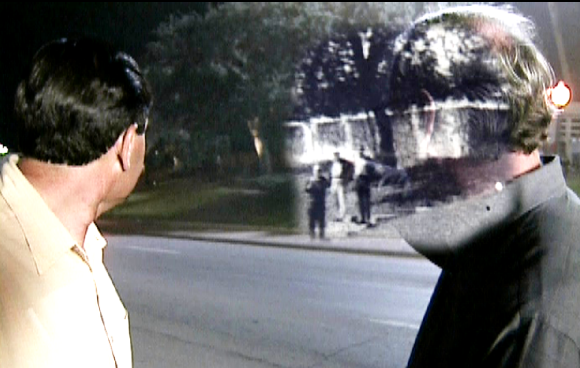 In another segment in the 2003 episode, “The Conspiracy Myths”, we can see this example (shown above) of an accurate overlay with the Moorman photo laid over their stand in for President Kennedy on Elm Street, and also an historically accurate one for their 2008 UH JFK episode “Inside the Target Car”, which again Gary Mack and Robert Erickson were both involved in filming and producing, yet in these instances both of the computer created overlay images have the three spectators in their correct placements. So it is quite obvious that with the fraudulent overlay’s creation in 2003, that there was a fine hand behind their manipulation of known facts in the directorial and productive aspects of this UH episode. Considering his role or position, Robert Erickson must have played a role, along with the Sixth Floor Museum’s head curator and archivist, Gary Mack as the front man for this and other lies in separate JFK UH productions’ oddly always working alongside Erickson as a producer and director. Sure Does not Look Like Only a “Conspiracy Myth” Anymore now Does it? At the website CTKA.net researcher and author Jim DiEugenio posted his letter he sent to Robert Erickson and another to a Discovery Channel executive, which is who bought and aired the UH JFK productions. Erickson wiggled away from DiEugenio’s criticism and questioning in his letter by simply ignoring it, and though now there is enough visual proof of his involvement in at the least, by altering the historical record whether it out of incompetence or a sinister agenda. Erickson and Mack can continue to ignore this criticism all they want, but now the public can be informed of their character. In any way, Erickson does not deserve to be producer or director of any historical productions. Essentially most of his work although supposedly attempting to find out more information is based unsubstantiated nonsense, or ends up with that as their results. And of Gary Mack, how can he retain his position as head curator and archivist with the Sixth Floor Museum, when he has been a part of mangling the historical record for all these years? Truth in history and the present should be a sacred word passed down or then else we have compromised the worth and meaning of all that has come before us. We all could have a better world if we each strived to do so. What better way could we value what preceded us and individually comprehend that in the past there was commendable and there was deplorable just as there is today, and then so be capable of truthfully illuminating any and all subjects know matter what the national repercussions might be. ParaDOXical: Only Accidental or an Act of Manipulation? Does this not then invalidate the SBT? As for the title or definition of the single bullet theory itself, I would classify it as that of a single bullet hypothesis. Not yet a verified thesis, so then categorized as below a thesis. Even if accepting that the physical condition of Warren Commission Exhibit-399, the spent ballistic round known as the “single bullet”, is compatible with a round that has been fired and entered and exited through two persons and breaking multiple bones. There still remains quite sufficient evidence which shows that the single bullet trajectory is not physically possible considering the damage it’s said to have caused, and not even logically plausible in theory; especially when an unbiased mind scrutinizes over this new evidence which is presented as its ultimate validation. When an accumulation of all the previous evidence in favor of a single bullet causing multiple wounds to two victims in the Presidential limousine is holistically gathered, and scrutinized by an unbiased mind, it then becomes quite apparent that there are many breaks in the links of the SB hypothesis, which prevents a solid chain of its legitimacy to form. As you read further it could become quite apparent for oneself to fully comprehend that there is instead valid proof of its illegitimacy, and that the SBT is merely a falsified theory backed by at times with their own examples of fraudulent evidence, and used deceitfully to deny the truth of at least two shooters firing at the motorcade, therefore denying a conspiracy in President Kennedy’s murder. Here then we’ll not waste time referencing or bothering with results of live ammo reproductions, or fantastical hypothetical computer animations and bullet path tracings, or that of examining the conditions of CE-399 to that of other Mannlicher-Carcano test bullets. There is even no bother with the results or claims of supposed nuclear physics tests, or even looking for broken bones in x-rays where there should be evidence of broken bone along the path of the SB tracing, or with estimating how many grains of lead were left inside of Governor Connally’s thigh and comparing that back to the original weight of the CE-399. So what then remains is the evidence most closely representative of the conditioning of the wounds apparent on the Presidents body that afternoon and evening. That would be the photographic evidence taken at the time of autopsy. Now, since over the last decade there has been a recurring piece of evidence shown over multiple JFK TV productions, and is said to be such a representative of the photographic record of the President’s body at the time of autopsy, which then is claimed to convincingly corroborate the findings of the SBT and elevate it to fact. As WC lawyer Arlen Specter has so controversially claimed. Unlike Specter, we will use our powers of logical reasoning to scrutinize this newly seen supposed photographic evidence, and see if it holds up logically to its said authenticity. 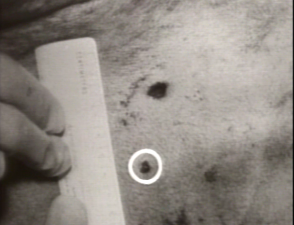 Because this newly surfaced, “autopsy photograph”, evidence is what has now been repeatedly used as an authenticator of the SBT, now over the last decade on multiple JFK documentary’s and has even served as a place marker in a supposed scientific search and used for placement in a subsequent live shot test, which in the end claimed to support the SBT findings. Therefore it is the most relevant evidence to scrutinize, and to try and see for ourselves if it holds up to their supposed claims. As should all new finds, especially those that seem to come to surface years later and which have not been previously noted as proper prima facie evidence. As this case has now been thoroughly documented for years and I do not ever recall an autopsy photograph which was said to show a wound in the back of the neck. Whether it of entrance or exit, which is exactly what has been stated lately by WC apologists, even though this supposed “autopsy photo” shows a wound in the upper back, and not in the neck, so this evidence is quite skeptical, as it does not even match with the visual description stated over the last decade now, by a plethora of supposed JFK assassination expert’s. Let’s throw all the fancy forensic stuff out the window here, and get right to the heart of the evidence, which is this newly surfaced, supposedly authentic photographic proof of the back wound, claiming to have been filmed during the autopsy. (the source for this new evidence) Which is thus presented as evidence that concludes that a single shooter from behind inflicted all of the wounds to both men, with only three shots, with only one projectile having inflicted all but the head shot to JFK, and with one missing the limousine entirely, making up a total of three shots. (at right, an actual back autopsy photograph) We currently understand that the acceptance of the SB theory was of the utmost importance to the WCR, and because of only a maximum of three shell cases said found in the 6th floor snipers nest, with one bullet being stated as a miss; then therefore the WCR was cornered into stating that one “magic bullet” inflicted seven wounds into two men. Well that is of course if you plan on not telling the truth in the first place, and the SBT point of view seems, in my opinion, that it was concocted for this reason. That might be speculation, but now there is graphic evidence that has come to my attention, which logically concludes that this altered reproduced evidence was created by Ida Dox, a medical illustrator for the HSCA, to so reinforce the WCR’s incorrect findings, whether by incompetence or of corruption. When scrutinized with a logical mind and a deep fundamental knowledge of facts in this case, one can recognize that this supposed “autopsy photo”, which can be seen all over JFK TV specials in recent years claiming to suffice as the medical evidence to support the findings of the SBT, instead actually ends up exposing an agenda to falsely deny the presence of a multiple shooter. To inform the reader further, in reality their newly praised evidence is actually the altered Ida Dox charcoal pencil drawn medical illustration, having been fraudulently swapped out as that of a supposedly authentic, back autopsy photograph. (Notice the artifact circled in image below, this was left out of Dox’s drawing, and is likely the actual entrance hole. Now it is claimed by SB theorists’ that it was only a spot of blood.) What’s quite funny is that now when exposed bare, it then proves the opposite that the SBT is a lie, and that it only works when one alters evidence in an attempt to prove this falsity. Let’s now look over some multiple examples where this new photographic proof is fraudulently used to validate the SBT, on now a plethora of recent JFK TV specials in the last decade. One here can now have the opportunity of soaking in this instances of this presented as genuine evidence, yet this time exposed to the bone and not presented in a deceitful manner. This video or photographic proof can now be officially put to each individual’s test and everyone can see for themselves if the recent claims of its supposed authenticity will hold up to logical deduction. Now it seems we have again come full circle from that of a previous JFK assassination related article of mine, and again we will be closely examining another Unsolved History JFK TV special. A lot of readers are already fully aware that these Unsolved History TV production shows, on the issue of the assassination of John Kennedy, are in many instances not even working with empirical evidence. Instead they concoct or alter their own evidence or even use a previously created drawing or diagram in such a context that it is deceitful. So again we are scrutinizing another of UH’s audacious claims. 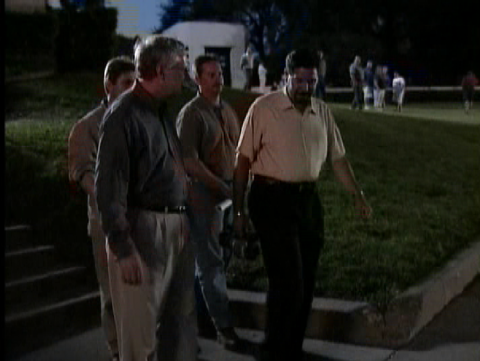 In 2004’s UH episode, Beyond the Magic Bullet, this segment has a chiropractor, named Chad Zimmerman attempting to settle the issue of where the bullet (CE-399) supposedly entered into Kennedy’s back. 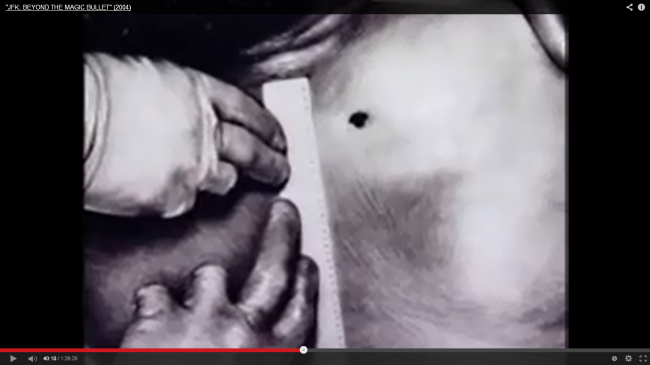 Let’s now look over their actual photographic evidence (see below), just as Zimmerman references his use of an “autopsy photograph”, this Ida Dox drawing is shown on screen as if it were an actual photograph, Zimmerman even uses it as a guide or marker for accuracy purposes in their alleged scientific experiment. See this video segment In their experiment Zimmerman attempts to use the “autopsy photo” to help in his guiding of a metallic marker placed on a stand- in’s body, for that of JFK. This model is said to be a man with nearly JFK’s same physical stature. The experiment becomes an elaborate attempt to understand whether a small metallic marker on the JFK model’s shirt, supposedly placed in the correct entry spot of the back wound, (yet the guide for the placement is the Dox drawing masked as an authentic back “autopsy photo”), and with help from an X-ray machine, to see if these metal markers would line up or not on the models’ skin, and clothing positioned as if he were waiving to the crowd in the limousine. Basically they intended to see if metal markers on the clothing and the body of JFK’s stand in could be picked up on an X-ray image, and then if they could make one line to the supposed entry spot, and to that of the vertebrae being visible in the X-rays. The metallic marker on the clothing was placed lower on the models clothing to see if when the model was in a position such as waiving their right arm as if seated like Kennedy was in the limo, to then see if this would cause the clothing marker to move up to match the entry wound point. Yet in actuality all this was a compromised experiment passed off as a genuine scientific search, and it all seems to be deliberate nonsense as what does it matter if the shirt bunched up therefore causing a discrepancy of that of the entrance in the shirt or jacket, to that of the body? Because the official autopsy photographs of the back, being shirtless at time of the autopsy would show the exact entry point on the skin or body, the prima facie evidence to be exact. Since the body has decomposed the “autopsy photographs”, now are the most important and revealing pieces of evidence left today. This is most undoubtedly why they used the Ida Dox drawing instead of the photo as their marker guide, and then becomes capable to reinforce this falsity and orally verify this forged drawing as an official autopsy photo. So therefore this was not much more than an elaborate attempt for UH and Zimmerman to seem like they are actually scientifically attempting to uncover new knowledge where ever it may lead, but yet they are really using a confusing rouse to come in the end, to the conclusions of the WCR‘s single bullet scenario and reinforcing this altered drawing as an authentic autopsy photograph. The true authentic autopsy photo of the back is where the findings will be determined, that is what’s most important, because the clothing could possibly cause a contradiction but the flesh would not, because that is where the body is officially hit. In fact this UH segment showed for themselves that this discrepancy is possible, but they just want to use this confusion to reinforce their own falsified theory. Taken that and the fact that the “autopsy photo”, which is verbally stated as an actual autopsy photograph, by Chiropractor Chad Zimmerman, but although to be factual we now know it is the Ida Dox medical illustration, created during the House Select Committee on Assassination, and since it is not a photograph it is not a true or fully accurate representation of the wounds in Kennedy’s back, it then so violates the validity of the entire experiment. Basically one can interpret now that this was a sham segment in a less than scholarly episode, and it reveals that Zimmerman and at least one or more persons at the production level of this UH JFK episode had an agenda to obfuscate, first of all in trying to show that the clothing could cause confusion about the entry wound, and last of all and most importantly, to flat out deceive the wound of entry with a little help from Zimmerman and the Ida Dox falsified drawing they were able to much easier claim and get away with and present a false perception to the casual viewer that the back entrance wound was near the upper back and a lot closer to the base of his neck than it is in actuality. In simpler words, this whole segment is a lot of deliberate nonsense. It even spurred JFK researcher Pat Speer to type for his webpage a multiple page dissection of this one segment alone, but here a simpler expose’ shows it is only simple trickery that functioned as part of a complex pseudo-scientific experiment. Functioning as the drawing was intended all along since the HSCA days. We know this because during Ida Dox’s testimony for the HSCA, she portrayed a now obviously incorrect assumption that because she constantly looked at the authentic back autopsy photo, so that “no detail could be overlooked or omitted or altered in any way”. This she testified to during the HSCA, but we later will get into at least one detail that was overlooked or omitted, and thus the drawing became a slightly altered version of that of the photograph. Now this albeit was a very small artifact left out, but now recently this left out detail, is proclaimed to only be a lowly spot of blood. But if this artist rendition is an accurate representative of the area of Kennedy’s back and the supposed entry hole, then why did Zimmerman and UH not simply use the actual photo, and why is it verbally verified by Zimmerman, as an actual “autopsy photo”? These are two most important questions, we will get into the spot of blood debate further down, but for now let’s see if we can find any more recent instances where this altered drawing is used as if it were an actual autopsy photograph. Up until nearly the time of his death in 2012, Arlen Specter did an interview about his role in the WCR which was filmed in 2011 for the Pennsylvania Cable Network, and American History TV, then later airing on C-Span. The day Specter died I was watching C-span and this special aired, and once I found out they were going to show “graphic autopsy photos”, I knew I had to record it on tape. I was grilling food outside that weekend afternoon, and in between checking on the food I went inside to check out the show, something inside was telling me important material would be aired, just as I walked in the room I heard Specter speaking about how the autopsy doctors noticed a wound in the back of the neck. Now this sounded quite familiar. At the bottom of the screen, in sporadic moments was where a disclaimer read which states, “warning graphic autopsy photos”, yet sure enough once again, at one point a such graphic “autopsy photo” was shown with Specters’ statements of the back wound being in the back of the neck, it was though in actuality once again the altered Dox drawing. Although this time with a large artists’ canvas blank section seen in the bottom left hand corner, and they even laughingly included the artists’ signature (Dox), at the bottom of the left hand corner of the drawing! (See Dox signature in left bottom corner of drawing below). Watch this part of Specter’s interview. This blank section of the canvas’ left side is so large that is causes Kennedy’s upper left back to have quite a unique symmetry, than that of the anatomically correct right side drawn, or with that of the real photograph that it was intended to suffice as. For anyone that would be skeptical as to it really not being a photograph needs to look no further than the fact that someone signed the bottom, and the blank section to denote it as a drawing. When Ida Dox drew this I am sure there was intent to leave a section blank and sign it in the blank section, so as to leave no doubt it is a reproduction. So this leaves the question, why is it shown on screen in the Specter interview at the moment he describes Dr. Humes’ statement of the wound said to be in the back of the neck? 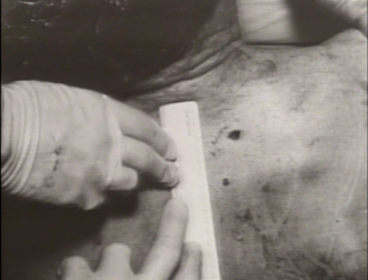 There even is a banner sporadically stating warning “graphic autopsy photos”, and in the screen capture seen above at the moment the Dox drawing takes the place on screen of an autopsy photograph, one can clearly see and take in that the production personnel wished for the viewer to see and take Specter at his word. This to me looks like a desperate attempt to convince the public or viewers that the SB trajectory was plausible and evidently happened, but now we should know much better than to believe that, especially after this article has just explained how the same altered drawing was passed off as an autopsy photograph previously. Although cropped more conservatively it was even used as a marker in a supposedly valid scientific experiment. But basically it was just a sneaky attempt to falsely back up the claims of the invalidated SBT. So if Specter and Zimmerman must be incompetent enough to not realize that the image used as a guide in Zimmerman’s case, and later added in production for Specter’s, is not an actual “autopsy photo”, then can we really believe anything they say? Especially when Zimmerman himself uses the supposed autopsy photograph for his guide for the metallic marker, yet it is really the Dox drawing instead, and Specter was the driving force behind the SBT. I wonder if Zimmerman’s version which he used as his guide, did it have the canvas blank space and ensuing Dox signature? One cannot fathom how they could be duped by a drawing, so then most minds would start to think about what kind of agenda is being perpetrated here? We need to see if there are more instances where this Dox or another altered drawing is being showcased as an official autopsy photograph. With the huge onslaught of inaccurate propaganda shown on TV airing during the 50th anniversary of Kennedy’s death, I was sure to keep my eyes open during any newly produced specials. Sure enough one production and another former WC staffer just couldn’t wait to join in on the Dox/photograph switch- out fun. Now that Specter, former WC staff lawyer and creator of the reasoning of the SBT has passed on, there are no more chances for new interviews with him, and so former Justice Department Lawyer and liaison to the WC, Howard Willens got the call up to the majors to replace Specters vacant position. In the somewhat recent CNN special called the Assassination of President Kennedy, airing near the end of 2013, during the run of the main stream media’s 50th anniversary specials of beating down of facts and truths’, this CNN episode surely fitting in that mold first aired in mid-November of 2013 and was partially produced by Gary Goetzman and supposed historian Tom Hanks. And yes, at times like Hanks’ day job, the facts and evidence presented did take on a Hollywood like stretch on the truth. At one point when the topic turned to whether there was a shot from the front or only from behind, a man named Howard Willens but who many do not yet remember, but who was the JD’s lawyer appointed to help name and organize other staff lawyers, makes his appearance and while he’s speaking on behalf of the Parkland Medical staff’s lack of knowledge of the back wound, while Kennedy was in the ER, (so much that they did not even know of its existence), and to the physical descriptions of the said “lone” wound in the back, so much and in a way as if he was one of the ER doctors in Trauma Room 1 himself. Anyway without the ER doctors not having turned Kennedy’s body over, logically there was no chance for these ER personnel to see if the wound in his back was of an exit or entrance. But yet still Willens and said to be historian Hanks and person(s) behind the CNN production, once again attempt to convince us of this photographic proof of an entrance wound in the back of the neck. (The type of entrance that could come from a downward angle six stories up so that it could exit through a person’s throat and wound another person in front of) Yet it is again only fraudulent evidence designed to pass as a genuine autopsy photograph. So the fact that the Parkland medical staff did not pick up or turn Kennedy’s torso over to examine for wounds in his back makes it possible for someone like Willens to easily openly challenge their findings as far as the debate over the back wound. At this point it seems to be the Doctors original accumulated conclusion versus that of the professional investigative word of someone like Willens. So in a certain segment where former WC lawyer, Howard Willens ioward Wigoes on to explain how there was a, “wound in the back of the neck”, and then with help from a visual aid on screen, that being the Dox drawing, yet it appears on screen, with a title of “President Kennedy autopsy photo”. So it then became quite easy for the viewer to take this as actual proof of the validity of the SBT, and that evidentially it did occur, because we just showed you how, yet even the drawing does not show a “hole” in the back of his neck, it is in the upper back instead. 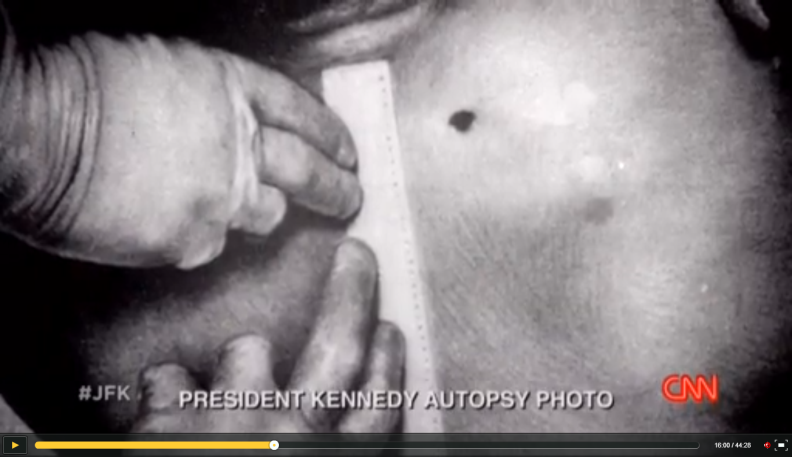 So there is a another serious problem once again when the supposed actual Kennedy back autopsy photo appears on screen along with a caption added that states, “President Kennedy autopsy photo”. 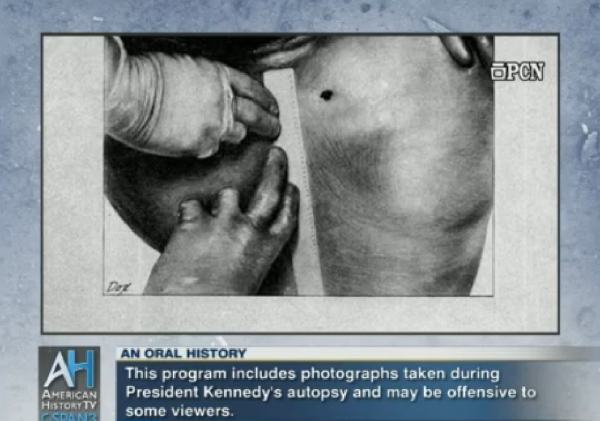 (see screen grab below from the CNN special) We now know that in actuality it is the Dox drawing that personifies the HSCA’s altered version of Kennedy’s back and wounds. So this altered drawing does not accurately personify a genuine representation of Kennedy’s back on the autopsy gurney on the night of November 22, 1963. And no matter how many times it is reiterated as so, there in fact was no wound in the back of his neck, be it either entrance or exit. Not even in the known “true” photo or either in the Ida Dox altered drawing. Now let me note that Willens goes so far in his false confidence in his work, that he states that he wished for some critics of his and the WC report would be so bold, as to tell him to his face that he and the WC report were either thoroughly incompetent or corrupt., or even some of both. Well Mr. Willens consider this to your face that your own evidence supposedly validating the SBT is now proving how wrong you and this production are, so I hope you read this. I cannot completely make up my mind as to whether you and others involved with this and the other productions exposed here, whether you are corrupt or incompetent in this investigation, but it must be one of the two, or even more likely both traits combined. After all how can you get the wounds stated incorrectly and then not even recognize that the supposed autopsy photo, which shows your said proof, was instead actually the altered Dox drawing and not an actual photographic record from the time of autopsy? Did you, Willens, even watch this scene or the finished production, or were you using the same obvious version of the Dox drawing which Zimmerman used for his guide? Either way, something is seriously wrong. Because this is even shown during a part of your own commentary while you seem to be giving a firm reassurance that as a WC lawyer, that you knew of this supposed authentic “autopsy photo”, which you said showed a wound in the back of the neck, but was actually in the upper back, and this as we know now, is a fake autopsy photo, and you Willens, seem to be attempting to give it life as a supposed known fact. This scene also seemed to take advantage of falsely implying that this altered Dox drawing, under the cover of an actual autopsy photo, was the proof that Parkland ER Doctor Malcolm Perry was blatantly wrong in his early statements of the throat wound being that of an entrance wound. When all the early rumors and articles printed the day of the assassination, implying that the collective opinion of the doctors was that of an entrance in the throat became so prolific from that day up until now, and so it seems persons like Willens have seemingly felt obligated to keep the SB hypothesis alive, no matter at what consequences. So this is definitely a case of him and or others, being “entirely corrupt”, or “thoroughly incompetent”, as Willens, proclaims persons have stated or hinted at, although Willens prefers that one tell this to him in person or to his face. Since Willens is alive and Specter dead, I sure hope you get to read this Mr. Willens. Do not forget that you asked for it. There is nobody to blame but you and the others for these mistakes or lies, however one may look at it. It is their own doing, and when prompted to produce some sort of evidence to stall the growing movement in the disbelief in the SBT, it then becomes even less plausible when we see that their own supposed photographic proof is nothing but the results of a calumniation. In thinking logically the only reason to use a drawing and pass it off as the photograph, is that they know that the second artifact or spot of blood to some, that was removed in the drawing was actually another bullet wound. Because why else would they have to use the Dox drawing as if it were actually the autopsy photograph? Because thinking in the mode of logical deduction then they would just show the actual photograph and not have to use the Dox drawing deceptively. This is the ultimate proof by indication, in that they get exposed using the drawing, so therefore the spot of blood must be in actuality an entrance wound. And the wound left in the drawing likely was the exit point from the frontal throat shot. When after 50 years this new photographic proof claiming to back the finds of the Single Bullet Theory are only fraudulent, altered examples of evidence masqueraded as authentic, and yet still are said by two lawyers, one being Willens, chosen from the JD ranks to aid the WC, and another a WC staff lawyer, Specter, who created this false theory, then we must logically conclude that the SBT is blatantly false. Many have had speculations that it was, and now we can see the actual proof, from the liars own minds and repeated presentations of their fraudulent evidence, and if this drawing was an exact example of an autopsy photo, then why do they not simply just use the real photograph instead? This is the ultimate question to ponder in this case and in this age when one is questioning whether there was a larger conspiracy, or only a lone shooter behind the assassination of President Kennedy.